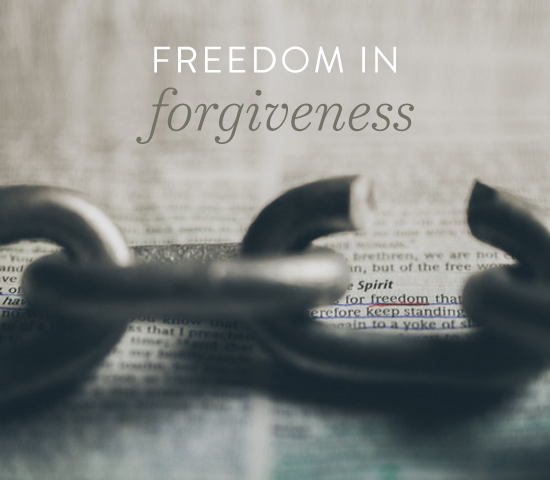 Dashing Devotional: Finding Freedom in Forgiveness. With today being Good Friday, I had plans to write about the most amazing gift that God ever gave, His Son Jesus. However, when I went to write this devotional, God placed something different on my heart than the traditional Easter message. As I began to think about Jesus, I couldn't help but think about a common theme of His life and death, which I believe comes down to love and forgiveness. I know that forgiveness isn't necessarily the most enjoyable thing to talk about, and it can be a hard topic for some. However, when we think about Jesus, it is impossible to separate the two. Romans 3:25 tells us that, "God presented Jesus as the sacrifice for sin. People are made right with God when they believe that Jesus sacrificed his life, shedding his blood." Jesus's sacrifice was the greatest act of forgiveness that the world has ever and will ever know. There is truly no need to go in depth beyond this perfect sacrifice, but it goes without saying that Jesus also displayed forgiveness countless times in His own life to various people who ridiculed and mocked Him. One of these people included His disciple and close friend, Judas, who betrayed Him when He needed him most. And we can't forget the act of mercy He displayed to the thief hanging on the cross next to Him, even at His own darkest hour. This my friends is why I want to talk about forgiveness on this Good Friday. Because on the day that we set aside to think about what Jesus did for us, and how He died while we were yet sinners... We would be unjust to think that we have a reason or a right to hold unforgiveness towards anyone, when Jesus paid the ultimate price for us to be forgiven of so very much. Regardless of who you are, one thing is true for us all, and that is we have all been hurt by people. Relationships can be one of the most uplifting things in our lives, and at the same time, one of the most damaging. There may be things done or said about you that seem unforgivable. You may find yourself in a place wanting to forgive, yet the hurt and pain is still gnawing at your memory. Often we find ourselves in self-protection when we have been hurt, and we put up walls to shut people out. So, how do we get past the pain and find freedom in forgiveness? One of the most important steps is realizing that forgiveness is not a feeling. It is a commandment from the Lord, and it is ultimatley for our own good. It is also not an excuse for what was done to us. When we forgive, it is not allowing that person to get away with what they have done. Forgiveness does one thing… it sets US free. When we hold on to the hurt and pain of our past, it keeps us bound there. When we find it hard to forgive, we can go to the Father and ask Him to change our hearts towards that person, and to help us see them through His eyes. Ultimatley, He would never expect us to do this on our own, and He would never ask us to do anything that is impossible for us to do with His help. In fact, Jesus knows exactly what we are going though when we are wronged by others, yet He was the perfect example of forgiveness. We see in the Bible that He didn’t just forgive the people of their sins, but He prayed for them, and blessed them. Today as we meditate on the goodness of our Savior, let us remember the legacy of love and forgiveness that He left as an example to us. He is ready and willing to and pour out that same love into our hearts towards those that have hurt us, all we have to do is be open to receiving. When we forgive those that have hurt us, it is then that the healing can begin in our hearts, and we can be free.